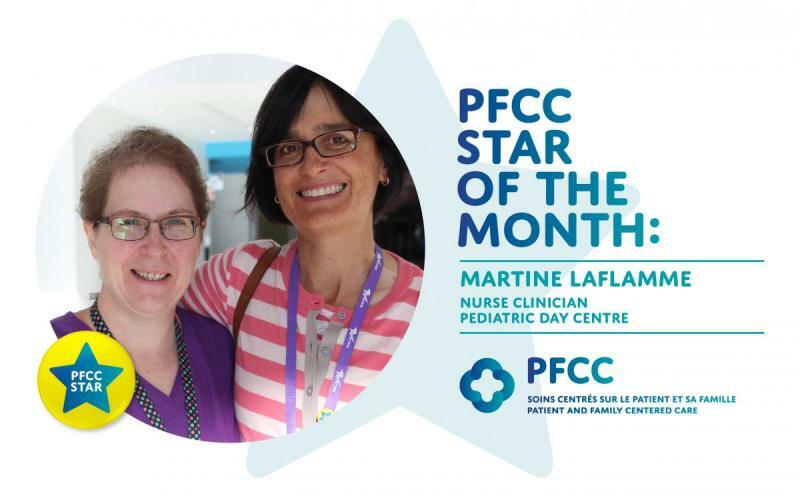 Dr. Indra Gupta, who received the Children’s PFCC Star award in August, nominated her colleague Martine Laflamme, to receive the award this month. Martine has worked in the Children’s Day Hospital for six years, and before that worked on the hospital’s medical inpatient unit and in several different departments. Martine was drawn to the idea of working in the Day Hospital, which has evolved significantly in the past decade to allow children with serious and chronic diseases to come to the hospital for treatment but still go home at the end of the day. “In the past, many of these children would have been admitted for lengthy periods so we’ve made so much progress in helping them spend less time in hospital,” explains Martine. Martine says her colleagues in the Day Hospital make up an incredible team and she credits the Child Life staff with teaching her a lot about finding ways to put children at ease. “You have to prepare a child both physically and emotionally for a treatment or procedure,” she says. “You don’t really succeed by going quickly; you have to take your time and figure out what will work best for each child.” Martine says some of her most satisfying experiences are when she can help a child overcome their fear or anxiety about a treatment.